MEDINA, Ohio--(BUSINESS WIRE)--Darkside Scientific, creators of LumiLor Light Emitting Coating, is working with European aircraft manufacturer Airbus to create electroluminescent exterior markings for aircraft. The announcement was made today. Airbus Innovation leaders say they’re impressed with the technology behind LumiLor and see promising possibilities for the future. Learn more about LumiLor and Darkside Scientific here. About Darkside Scientific: Darkside Scientific, headquartered in Medina, OH, is the world leader in Light Emitting CoatingsTM (LEC) for manufacturers and the aftermarket. Its signature product, LumiLor, is a patented electroluminescent coating system which enables anything to be turned into a source of light without changing its form or function. 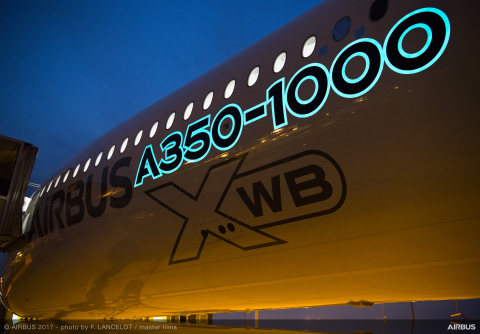 Darkside Scientific is working with European aircraft manufacturer Airbus to create electroluminescent exterior markings for aircraft.